Today there are dozens of log management tools to choose from. But the best log management tools offer capabilities that go well beyond just collection and aggregation of log data and basic search capabilities. Merely indexing all the logs from all IT components, such as servers, network appliances, machine data, third-party applications, and home-grown applications will only result in thousands of search results on any query. The vast amount of data generated by these systems means that you should not necessarily search for a specific log data record, but rather receive actionable business insights and gain situational awareness of your IT environment. 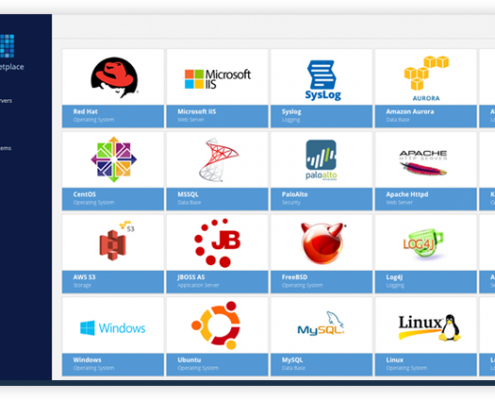 Logstash, filesystem, databases, Windows systems, Linux machines, cloud applications, and more. Once all the data is collected and indexed it is used for search, log monitoring, SIEM, compliance reports, and log analysis. At this point, XpoLog Analytics search can harness machine learning and AI technologies to unlock important insights and surface the most relevant errors and events in the log data. Instead of installing intrusive agents on every system to collect the log data, XpoLog Log Management implements agent-less collection using SSH. XpoLog is completely non-intrusive and has a very low footprint with no impact on the sources. By using the existing protocols, XpoLog does not require any changes to your infrastructure providing an immediate collection of log data. The XpoLog data collection mechanism detects dynamic changes in the log data, and manages references to the sources to ensure that the data collection is complete. XpoLog can collect log files from Windows Event Logs, Syslog, Database tables, and all textual files of any format. The data can come from multiple logs from local and/or remote infrastructures, including servers, applications, application servers, Windows machines, UNIX and Linux machines, network and security devices, databases, and data centers. XpoLog can also track and collect end-user transaction logs. XpoLog uses UPD or TCP Syslog listeners to receive events from one or more sources, including Linux Syslog. Once XpoLog receives Syslog data, it can automatically create dedicated logs per source device. XpoLog parses and indexes all log events, allowing search and log event correlations between data sources as well as tracking of IP address across log sources and events. Databases with a JDBC driver can be accessed by XpoLog without using an agent. XpoLog automatically recognizes multiple types of Windows Event logs, while identifying System, Security, and Application-related logs. XpoLog features integration with Hadoop HDFS databases. As part of the integration, XpoLog applies automated pattern recognition, which can be fined tuned at any time. XpoLog offers comprehensive integration with Logstash. As part of the integration, XpoLog enables Logstash users to create Web access log statistics, application log error summaries, performance charts, and other reports, quickly and efficiently. Statistical queries instantly visualize log data, which can be used to build charts, dashboards, geomaps, and much more. XpoLog can be integrated with Log4J. XpoLog can access Log4J files through direct access or by defining a Syslog appender and sending the events and messages to XpoLog. Once the log events have been pushed/pulled, XpoLog can start collecting, parsing, monitoring, and analyzing all your log data. Log events are automatically parsed and index to an abstraction layer that enables smart correlations between different data sources. For example, tracking IP address across different log sources and events can help detect problems and security risks, while showing when certain transactions started and when they ended. Also, such correlations can be real eye-openers in cases where different logs from different sources experience similar anomalies. XpoLog uses advanced analytics technologies to identify important errors and problems in your log data. While you search for information, the XpoLog Analytic Search engine layers Intelligence Augmentation Panels on the search results, which highlights important events, anomalies, and more. Based on your data, XpoLog suggests relevant Analytics Apps, which are packed with pre-defined dashboards, reports, rich visualization, and custom alerts. XpoLog server logs analysis system works in real time on all servers types – Windows, Apache Tomcat / JBoss, Linux, IIS / IAS, Network, Syslog, .Net, Logstash, Log4j, Slf4j, and other 3rd party vendors – and is specifically designed for IT Admins, DevOps, Developers, and Apps managers. XpoLog automatic Analytics on logs files presents detailed logs data reports on physical & logical system entities from all log files and run both on-premises or in the cloud. On the Errors sides, XpoLog automatically tracks invalid transactions, not found pages and security breaches and more to get a real-time view and analytics of all your servers issues. You get periodical alerts, reports, and notifications on all your important insights. Your infrastructure will not change – XpoLog agent-less logs analysis architecture uses common protocols such as UDP/TCP to connect with all your servers and devices so you can search log files and application data even faster than ever before, and gain visibility into unknown problems, errors and anomalies with live NOC dashboards on all multiple application tiers. You design your system so users have the best end-user experience – XpoLog logs analysis server is designed so You have the best experience in debugging your system’s servers and increase your users’ user experience and company’s reputation. With XpoLog server logs analysis and reporting system, you see all application performance and quality problems issues in order to take immediate actions on. XpoLog Server Logs Analyzer visualizes your hidden your machine-generated data values as well as errors with a set of built-in dashboards and presents advanced log data analytics on physical & logical system entities from all log files across multiple clusters and run both on-premise and in the cloud. The auto-pilot mode enables you to view dashboards in 2 clicks! XpoLog is highly customizable and you can work your system in a manual mode to fit your logs data analytics exact needs. With XpoLog you get periodical alerts, reports, and notifications on all your important insights. XpoLog’s built-in servers’ logs analytic layers scan your log files and application data and showcase a prioritize list of all insights and intelligence based on your users’ transactions. XpoLog logs analyzer has a patented algorithm that delivers a live Root Cause Analysis on all your servers logs across all folders. 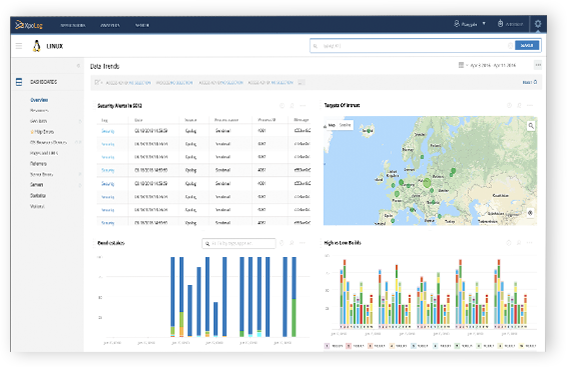 Analysis of logs pinpoints crucial problems and hidden values – XpoLog Server Logs Manager analyzes all logs across multiple folders and devices and presents critical IT, DevOps and Business quality and availability insights with a deep root cause analysis. Typical deployments include tens and often hundreds of servers, databases and applications, which may generate millions of events every day expanding logs content and overall storage exponentially. Both cloud and on-premise infrastructures make data centers even more highly dynamic and complex to analyze which in turn makes data analysis process even more tricky. XpoLog Logs Analyzer helps you unlock and discover IT hidden errors, problems, and patterns in any log data at any size as well as Business values by making any log data easily accessible for search and visualization in real time. XpoLog Server Logs Analyzer features advanced analytics, reports and Root Cause Analysis on all log types and sizes to discover hidden faults, improve your system’s uptime, reduce your IT problems thus increase your revenues. XpoLog integrates with all logs and scan – parse – aggregate – read – analyzes & report your logs’ hidden values in real time and presents your System’s Heat Map AKA Problem Map Dashboard: use cases, exceptions, usage, profiling, error codes, number of events in logs, and log problem per server. XpoLog server logs analysis platform serves Admins and operations teams which need a fast identification of errors, system trends and anomalies. XpoLog servers’ logs analysis provides full insights on all machine-generated data, applications data, software data and logs with an advanced visualization tools and automatic analysis that correlates your unique identifiers across servers and time like IP addresses, URLs & Hits, logs events, exceptions, faults, problems, geographic data, references, resources, requests, performance data, information on users and many more trends and statistics. Spend Less Than 5 minutes from Installation to Results, so Download Free Now and Get Free Online Support Sessions to Improve Your Log Analyzer Solution w/XpoLog Experts.